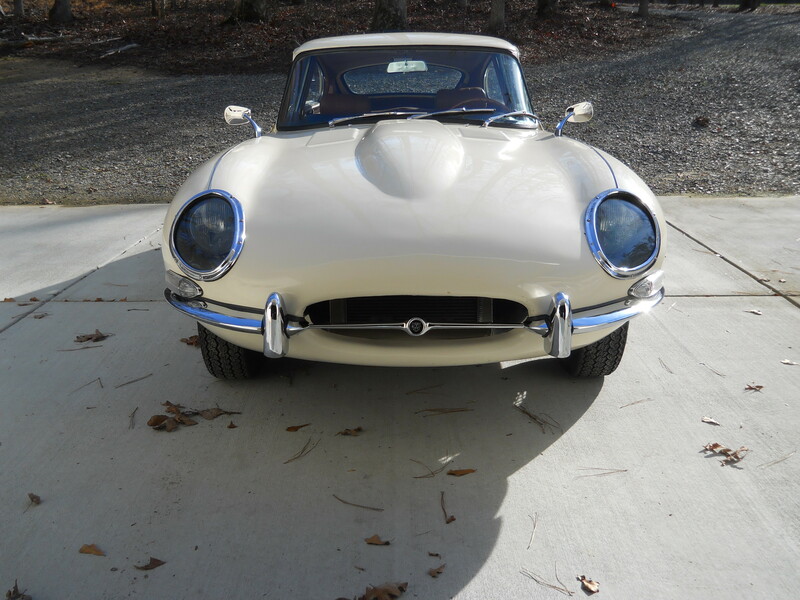 I have turned my attention to chrome bumpers and other shiny bits for the 1967 E-Type 2+2 restoration project. This is a phase of the project that I have put off for a while, as it is not cheap to implement. I took stock of the car and came up with a list of items needed to bring the car to a complete state. My list included major items like the front and rear bumpers. 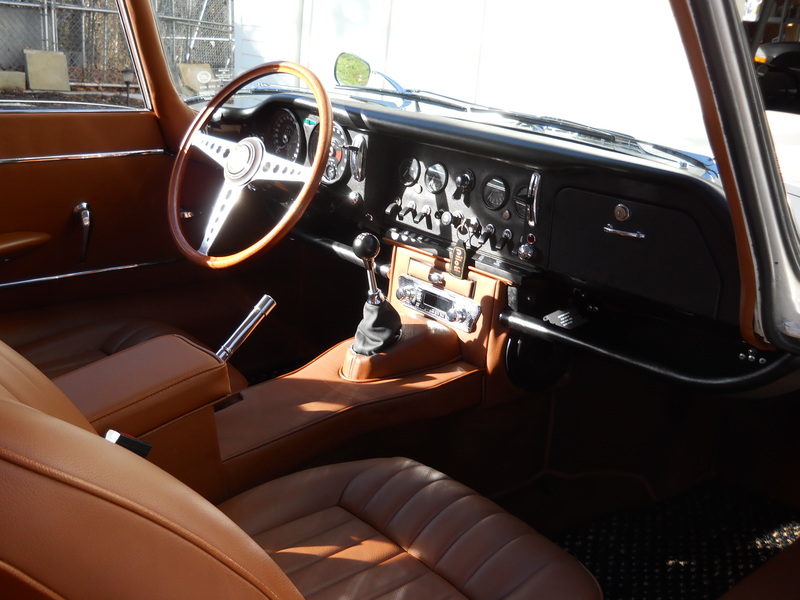 On the exterior, I also needed the chrome surrounds for the windshield and the glass in the rear hatch, the chrome trim strips that run down both sides of the bonnet, and the chrome accent trim pieces that run under the doors. My existing rear taillight assemblies had very shabby chrome. The license plate light and the backup lamp were missing entirely. Inside the cockpit things were in pretty good shape, although I needed window winder handles, a rear view mirror, the overhead interior light, a grab handle, and package trays for under the dash. I contacted Tony Lee at SNG Barrett and sent him a list of the items I needed for a price quote. Some of the items that were totally missing had to be purchased new. In the case of the bumpers I was able to make a decision as to whether to buy new or get my existing items re-chromed. There are several factors to consider. First would be the direct cost comparison. After some research I decided to send my potential chrome business to Paul’s Chrome in Pennsylvania. I was somewhat surprised and impressed during a phone call I had with one of their staff. I started by explaining what car I owned. 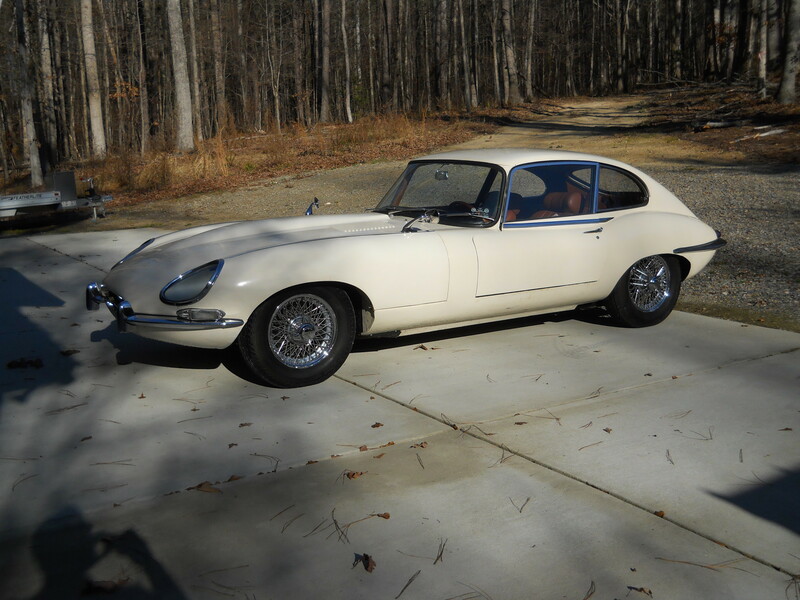 It became quickly apparent that their sales rep was able to pull up an image of the car showing all the potential chrome parts as she immediately was able to relate to my verbal descriptions of the major parts I needed chromed. She was able to give me price estimates over the phone, with the caveat of course that items in poor physical condition would require extra work and extra cost. Fortunately all my pieces were in sound condition. So after this conversation I had a price comparison to work with. I had to consider that original parts could very well be of more robust construction than new parts. The way the existing parts fit on the car would be known in advance. For instance, Tony Lee advised me not to buy new rear bumpers from SNG if I had the original pieces, as every car was a little different in shape and I might find the new bumpers not to fit very well. Very long or thin items like window trim may not be a good candidate for re-chroming only because the necessary work on the buffing wheel may damage the part being salvage. I know. I have damaged some of my parts when the buffing wheel grabbed ahold of them and flung them across the room! A final consideration is time. Pauls wound up doing a very nice job on the pieces I sent them but it took about 10 weeks for my job to make it to the top of their queue and be sent back to me. Again, the results were very nice but there was that wait time. In the end, I only had 2 of my existing parts re-chromed, these being the rear bumpers for the reasons stated above, and the A pillar trim, which is unobtainable as a new part. So I placed a large order for new parts from SNG Barrett. The quality of the items I received from them has been very good. But even ordering new parts may result in a wait time, as it has turned out that a few of the items I need are on backorder. The end result of putting the parts on the car is rather magical, as each item really dresses up the car and brings you tantalizingly close to completion. That said, you have to be slow and methodical at this stage, as any mistake may be visible for years to come. 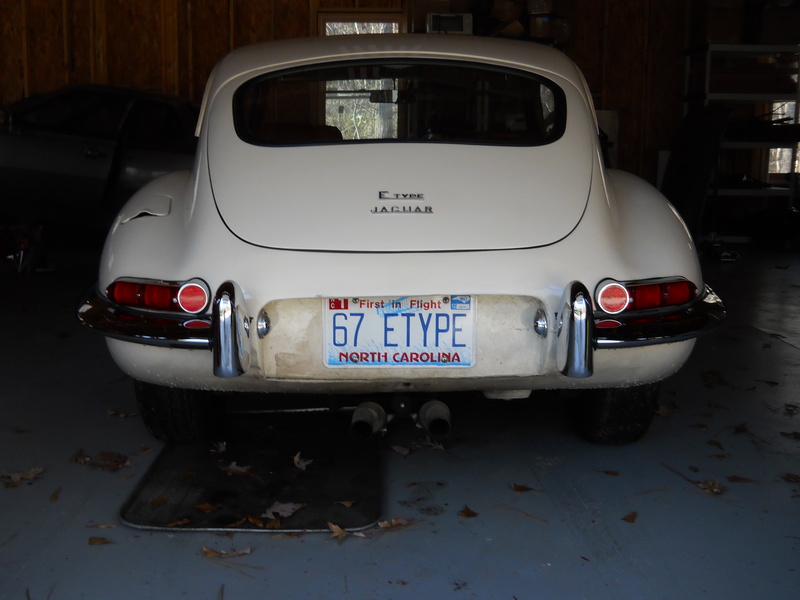 The front bumpers on the E-Type are a little bit of a jig say puzzle. There are long “blades” on the sides, “bumperettes” (or overiders), the short pieces that bend into the air intake opening, and finally a motif bar that spans across the air intake. I had to cut custom tapered shims to go between the blades and the body in order to get them to mount correctly. I probably spent the better part of a day just getting the front bumpers on. Balancing this out, the rear view mirror popped into place in about 5 minutes! The rear bumpers weren’t quite so fiddly but they took several hours to mount into position correctly. Another annoyance was the trim piece on the doors under the windows. These trim pieces had very small threaded holes on their backside for mounting. A trip to the hardware store revealed no screw in the store that would engage the holes correctly. It turned out the holes were a very small diameter metric thread profile. I had to order the necessary screws from McMaster-Carr. I have 46 of the package of 50 left over, if anyone needs some! The package trays under the dash required some work. They are basically fabricated from heavy cardboard. I decided to reinforce the mounting points with small steel plates attached with pop rivets. Screws attached directly to the cardboard would have torn out the first time anything heavier than a roadmap was placed in the trays! With these items installed, the car is looking very sharp. I can see the end from here!